ET Fast Food is Responsive Joomla! template that for fast food website. 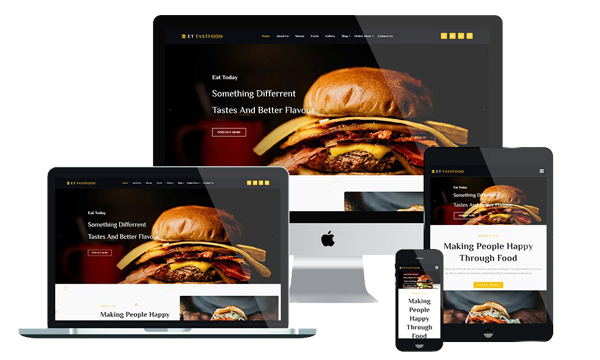 Our Joomla Restaurant Template is specially created to offer fast food restaurant owners the possibility to develop without spending a fortune on online marketing. That’s why we used high-resolution images with healthy fast foods that look delicious and make the viewers wonder about its taste. It builds with latest Bootstrap CSS Framework, Support Font Awesome, J2Store and K2 extended style. Moreover, Fast Food Website is energetic and it motivates people to visit the restaurant while keeping it simple for the administrator. Each template is easy to install and configure and allows anyone to customize the design and edit the settings. ET Fast Food comes with a variety of widgets and modules, easily accessible from your personal CMS Panel. These Cafe and Restaurant Website Templates allow you to tailor your website to your restaurant’s needs. Besides, you also benefit from a range of extra features, such as cross-browser compatibility and drop-down menus, all of which enhance the user experience for your patrons. Visit our Joomla Restaurant Template with mouthwatering images and fantastic designs today!